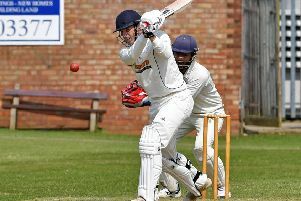 Sleaford CC First XI’s season drew to a close with defeat in their Lincs ECB Premier play-off semi-final at Grantham on Saturday. Grantham won the toss and asked the First XI, sponsored by Baker Plant Hire, to bat first. Ross Diver and Matthew Mountain began confidently and the partnership reached 29 before Mountain was caught by Wing, off Peck, for eight. Diver followed with the addition of only one run, lbw to Dowman for eight, and Charlie Roberts was then bowled by Dan Freeman (3 for 47) for seven. Oliver Burford joined captain Tom Shorthouse and also fell to Freeman on 5, and Angus Youles went to the same bowler for four as Sleaford slumped to 65-5. Iain McPeake joined his skipper and they played positively until McPeake was caught on the boundary off Neil Stevenson for 15. Shorthouse continued to accumulate, but on 27 was bowled by the returning Peck, leaving Sleaford 94-7. Conor Harbron was lbw to Stevenson without scoring, but Scott Tite and Adi Sreedharan combined to produce the stand that Sleaford needed. Tite was steadfast, while Sreedharan took the attack to the bowlers with a range of sweep shots and effective drives to bring up a superb 50 before he was finally caught off Matthew Dowman, the partnership producing 55 invaluable runs. Tite finally fell to Dowman (3 for 31) for 12 as Sleaford were bowled out for 161 in the 43rd over. Grantham openers Ross Carnelly and Jaden Fell looked in complete control from the start of the reply, as both pierced the field regularly. Sleaford used a range of bowlers as the partnership moved past 50, but Carnelly accelerated as 100 came up for Grantham. The partnership was finally broken on 113 when Fell was run out by Shorthouse for 37, and Sleaford responded well to the breakthrough to have Dowman caught by Shorthouse off McPeake for one, and Freeman caught by the skipper for 0 off Harbron (122-3). James Keast was bowled by Harbron (2 for 43) for 0, but Carnelly and Dobson saw Grantham home by six wickets, with Carnelly carrying his bat for a match-winning 87. Grantham went on to win the following day’s final against Woodhall Spa.